A PCI network device (specified in the domain XML by the <source> element) can be directly connected to the guest using direct device assignment (sometimes referred to as passthrough). Due to limitations in standard single-port PCI ethernet card driver design, only Single Root I/O Virtualization (SR-IOV) virtual function (VF) devices can be assigned in this manner; to assign a standard single-port PCI or PCIe Ethernet card to a guest, use the traditional <hostdev> device definition. Developed by the PCI-SIG (PCI Special Interest Group), the Single Root I/O Virtualization (SR-IOV) specification is a standard for a type of PCI device assignment that can share a single device to multiple virtual machines. SR-IOV improves device performance for virtual machines. SR-IOV enables a Single Root Function (for example, a single Ethernet port), to appear as multiple, separate, physical devices. A physical device with SR-IOV capabilities can be configured to appear in the PCI configuration space as multiple functions. Each device has its own configuration space complete with Base Address Registers (BARs). 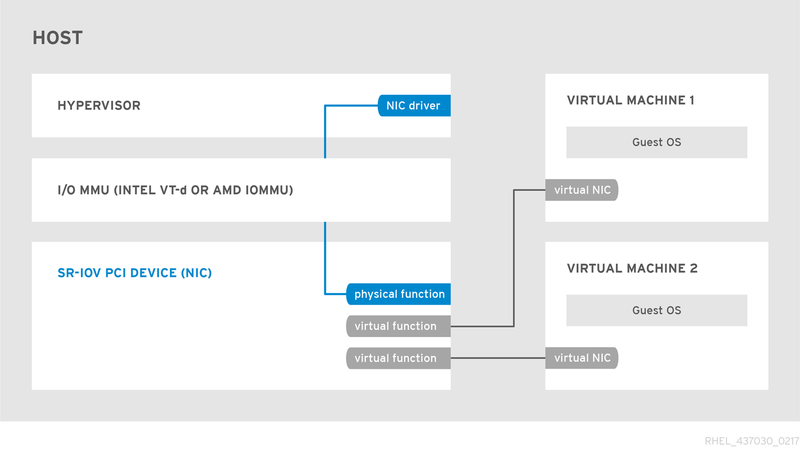 Virtual Functions (VFs) are simple PCIe functions that only process I/O. Each Virtual Function is derived from a Physical Function. The number of Virtual Functions a device may have is limited by the device hardware. A single Ethernet port, the Physical Device, may map to many Virtual Functions that can be shared to virtual machines. The hypervisor can assign one or more Virtual Functions to a virtual machine. The Virtual Function's configuration space is then assigned to the configuration space presented to the guest. Each Virtual Function can only be assigned to a single guest at a time, as Virtual Functions require real hardware resources. A virtual machine can have multiple Virtual Functions. A Virtual Function appears as a network card in the same way as a normal network card would appear to an operating system. The SR-IOV drivers are implemented in the kernel. The core implementation is contained in the PCI subsystem, but there must also be driver support for both the Physical Function (PF) and Virtual Function (VF) devices. An SR-IOV capable device can allocate VFs from a PF. The VFs appear as PCI devices which are backed on the physical PCI device by resources such as queues and register sets. SR-IOV devices can share a single physical port with multiple virtual machines. When an SR-IOV VF is assigned to a virtual machine, it can be configured to (transparently to the virtual machine) place all network traffic leaving the VF onto a particular VLAN. The virtual machine cannot detect that its traffic is being tagged for a VLAN, and will be unable to change or eliminate this tagging. Virtual Functions have near-native performance and provide better performance than paravirtualized drivers and emulated access. Virtual Functions provide data protection between virtual machines on the same physical server as the data is managed and controlled by the hardware. These features allow for increased virtual machine density on hosts within a data center. SR-IOV is better able to utilize the bandwidth of devices with multiple guests. This section covers the use of PCI passthrough to assign a Virtual Function of an SR-IOV capable multiport network card to a virtual machine as a network device. SR-IOV Virtual Functions (VFs) can be assigned to virtual machines by adding a device entry in <hostdev> with the virsh edit or virsh attach-device command. However, this can be problematic because unlike a regular network device, an SR-IOV VF network device does not have a permanent unique MAC address, and is assigned a new MAC address each time the host is rebooted. Because of this, even if the guest is assigned the same VF after a reboot, when the host is rebooted the guest determines its network adapter to have a new MAC address. As a result, the guest believes there is new hardware connected each time, and will usually require re-configuration of the guest's network settings. libvirt contains the <interface type='hostdev'> interface device. Using this interface device, libvirt will first perform any network-specific hardware/switch initialization indicated (such as setting the MAC address, VLAN tag, or 802.1Qbh virtualport parameters), then perform the PCI device assignment to the guest. the PCI address of the VF to be assigned. Assignment of an SR-IOV device to a virtual machine requires that the host hardware supports the Intel VT-d or the AMD IOMMU specification. On an Intel system, enable Intel VT-d in the BIOS if it is not enabled already. See Procedure 16.1, “Preparing an Intel system for PCI device assignment” for procedural help on enabling Intel VT-d in the BIOS and kernel. Skip this step if Intel VT-d is already enabled and working. On an AMD system, enable the AMD IOMMU specifications in the BIOS if they are not enabled already. See Procedure 16.2, “Preparing an AMD system for PCI device assignment” for procedural help on enabling IOMMU in the BIOS. Verify if the PCI device with SR-IOV capabilities is detected. This example lists an Intel 82576 network interface card which supports SR-IOV. Use the lspci command to verify whether the device was detected. This will ensure the feature is enabled at boot-time. The identifier for the PCI device is found with the -n parameter of the lspci command. The Physical Functions correspond to 0b:00.0 and 0b:00.1. All Virtual Functions have Virtual Function in the description. The libvirt service must recognize the device before adding a device to a virtual machine. libvirt uses a similar notation to the lspci output. All punctuation characters, : and ., in lspci output are changed to underscores (_). Use the virsh nodedev-list command and the grep command to filter the Intel 82576 network device from the list of available host devices. 0b is the filter for the Intel 82576 network devices in this example. This may vary for your system and may result in additional devices. The PCI addresses for the Virtual Functions and Physical Functions should be in the list. The pci_0000_0b_00_0 is one of the Physical Functions and pci_0000_0b_10_0 is the first corresponding Virtual Function for that Physical Function. Use the virsh nodedev-dumpxml command to get device details for both devices. This example adds the Virtual Function pci_0000_03_10_2 to the virtual machine in Step 8. Note the bus, slot and function parameters of the Virtual Function: these are required for adding the device. Copy these parameters into a temporary XML file, such as /tmp/new-interface.xml for example. When the virtual machine starts, it should see a network device of the type provided by the physical adapter, with the configured MAC address. This MAC address will remain unchanged across host and guest reboots. If you do not specify a MAC address, one will be automatically generated. The <virtualport> element is only used when connecting to an 802.11Qbh hardware switch. The <vlan> element will transparently put the guest's device on the VLAN tagged 42. Add the Virtual Function to the virtual machine using the following command with the temporary file created in the previous step. This attaches the new device immediately and saves it for subsequent guest restarts. Specifying the --live option with virsh attach-device attaches the new device to the running guest. Using the --config option ensures the new device is available after future guest restarts. The --live option is only accepted when the guest is running. virsh will return an error if the --live option is used on a non-running guest. The virtual machine detects a new network interface card. This new card is the Virtual Function of the SR-IOV device. SR-IOV network cards provide multiple VFs that can each be individually assigned to a guest virtual machines using PCI device assignment. Once assigned, each behaves as a full physical network device. This permits many guest virtual machines to gain the performance advantage of direct PCI device assignment, while only using a single slot on the host physical machine. The <hostdev> element cannot be used for function-specific items like MAC address assignment, vLAN tag ID assignment, or virtual port assignment, because the <mac>, <vlan>, and <virtualport> elements are not valid children for <hostdev>. Instead, these elements can be used with the hostdev interface type: <interface type='hostdev'>. This device type behaves as a hybrid of an <interface> and <hostdev>. Thus, before assigning the PCI device to the guest virtual machine, libvirt initializes the network-specific hardware/switch that is indicated (such as setting the MAC address, setting a vLAN tag, or associating with an 802.1Qbh switch) in the guest virtual machine's XML configuration file. For information on setting the vLAN tag, see Section 17.16, “Setting vLAN Tags”. Using virsh shutdown command, shut down the guest virtual machine (here named guestVM). Run the virsh save-image-edit command to open the XML file for editing (refer to Section 20.7.5, “Editing the Guest Virtual Machine Configuration” for more information) with the --running option. The name of the configuration file in this example is guestVM.xml. Note that if you do not provide a MAC address, one will be automatically generated, just as with any other type of interface device. In addition, the <virtualport> element is only used if you are connecting to an 802.11Qgh hardware switch. 802.11Qbg (also known as "VEPA") switches are currently not supported. Run the virsh start command to restart the guest virtual machine you shut down in step 2. See Section 20.6, “Starting, Resuming, and Restoring a Virtual Machine” for more information. When the guest virtual machine starts, it sees the network device provided to it by the physical host machine's adapter, with the configured MAC address. This MAC address remains unchanged across guest virtual machine and host physical machine reboots. The specified VF must be available any time the guest virtual machine is started. Therefore, the administrator must permanently assign each VF to a single guest virtual machine (or modify the configuration file for every guest virtual machine to specify a currently unused VF's PCI address each time every guest virtual machine is started). If the guest virtual machine is moved to another host physical machine, that host physical machine must have exactly the same hardware in the same location on the PCI bus (or the guest virtual machine configuration must be modified prior to start). It is possible to avoid both of these problems by creating a libvirt network with a device pool containing all the VFs of an SR-IOV device. Once that is done, configure the guest virtual machine to reference this network. Each time the guest is started, a single VF will be allocated from the pool and assigned to the guest virtual machine. When the guest virtual machine is stopped, the VF will be returned to the pool for use by another guest virtual machine. Using virsh shutdown command, shut down the guest virtual machine, here named guestVM. Using your editor of choice, create an XML file (named passthrough.xml, for example) in the /tmp directory. Make sure to replace pf dev='eth3' with the netdev name of your own SR-IOV device's Physical Function (PF). Run the virsh start command to restart the guest virtual machine you shutdown in the first step (example uses guestVM as the guest virtual machine's domain name). See Section 20.6, “Starting, Resuming, and Restoring a Virtual Machine” for more information.